The night was a coming out party, a celebration of pioneering work, and a grand act of philanthropy. It was a melding of ancient and modern, and East meets West. "When we think about couturier, I think about the wonderful [John] Galliano or Valentino," said Yue-Sai Kan, founder and chairwoman of China Beauty Charity Fund (CBCF). "But tonight I thought we might just change a little bit and show you our couturier." Kan invited Chinese haute couture fashion designer Guo Pei to make her US debut during a night dedicated to Chinese art and culture. Last Friday, CBCF celebrated its inaugural China Fashion Night Gala at the Pierre Hotel in New York to raise money for the organization's Fashion Institute of Technology (FIT) scholarship. The scholarship will offer talented artists from China the opportunity to study at the New York school. It is supported by Fashion 4 Development's (F4D) internship program, which will help place graduates with global brands and give them access to angel investments to start their own businesses. F4D is a private sector global platform with the mission to harness the influence of the fashion and beauty industries to implement creative strategies for sustainable economic growth, preservation of culture, wellness and independence of communities worldwide. Individual tickets for the gala ranged from $1,000 to $3,000 and $10,000 to $30,000 for a table. The evening included an auction of Chinese artist Cai Guoqiang's work. 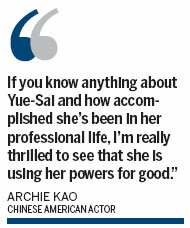 "If you know anything about Yue-Sai and how accomplished she's been in her professional life, I'm really thrilled to see that she is using her powers for good," Chinese American actor Archie Kao quipped while acting as master of ceremonies. Yue-Sai Kan is a Chinese American entrepreneur and a household name in China for her pioneering broadcast television work and for founding China's first cosmetic brand, Yue Sai. "I'm just a guy and talking about evening gowns isn't really my thing, but you can't help but be inspired by the artistry [of Guo Pei's designs]," Kao said. "Some of her pieces have taken thousands upon thousands of hours to create." Mistress of ceremonies, Miss Universe Olivia Culpo, said Guo appointed 450,300 embroiderers and 150 designers, pattern makers and sewing technicians to produce the gowns featured in the evening's runway show. Guo's debut presentation featured work from her "Legend of the Dragon" collection, including a gown inspired by stained glass domes of European churches and a gown adorned with thousands of "gong hua" silk flowers made exclusively for the royal palace and rescued from the storage room of a deserted factory. The flowers were carefully restored with steam, a process that took nearly 50,000 hours. "In China, Guo Pei is a legend, but you guys have probably never heard of her," Kan said after the exclusive runway show. Guo was commissioned to design the ceremony gowns worn during the 2008 Beijing Olympics. "Well, now you've heard of her." The gala was held in conjunction with New York Fashion Week for Spring 2014 collections, which kicked off on Thursday, Sept 5, and will end Thursday, Sept 12. CBCF also honored Chinese fashion veteran Vivienne Tam Friday night with an award in celebration of her commitment to supporting emerging designers. Tam was born in Guangzhou, China, and raised in Hong Kong. Tam was the first successful Chinese designer in the US and has been dedicated to providing opportunities to rising talent from China.